Preheat oven to 425 degrees. Butter 6 (6-ounce) custard cups. Place on a baking sheet. In a large, microwave-safe bowl, combine chocolate chips, unsweetened chocolate, and butter. Microwave on HIGH until butter has melted, about 2 minutes. Whisk until smooth. Add confectioners’ sugar, flour, and cinnamon. Stir until combined. Add eggs, egg yolks, and coffee liqueur; whisk until well blended. Divide batter among prepared custard cups. Bake until cakes are firm around the edges but are soft in the centers, 13 to 14 minutes. Let stand 1 minute. Run a thin knife around the edges; invert onto dessert plates. 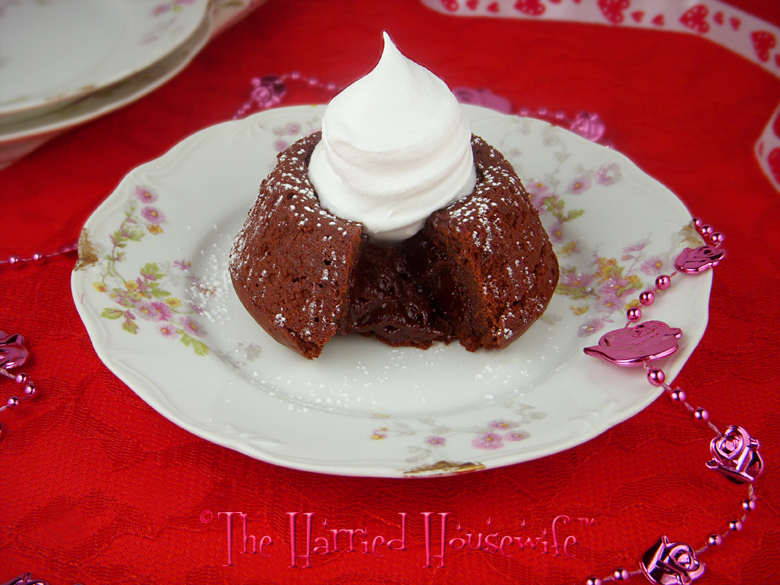 Top each cake with a sprinkling of confectioners’ sugar and/or a dollop of whipped cream, if desired. Makes 12 servings, 1/2 cake each.